This section shows how to implement local notifications in Xamarin.Android. It explains the various UI elements of an Android notification and discusses the API's involved with creating and displaying a notification. Base layout – a compact, fixed presentation format. Expanded layout – a presentation format that can expand to a larger size to reveal more information. Each of these layout types (and how to create them) is explained in the following sections. This guide focuses on the NotificationCompat APIs from the Android support library. These APIs will ensure maximum backwards compatibility to Android 4.0 (API level 14). A notification icon, which represents the originating app, or the notification type if the app supports different types of notifications. The notification title, or the name of the sender if the notification is a personal message. Base layouts are limited to 64 density-independent pixels (dp) in height. Android creates this basic notification style by default. The user can double-tap the lock screen notification to unlock the device and jump to the app that originated that notification, or swipe to dismiss the notification. Apps can set the visibility level of a notification to control what is shown on the lock screen, and users can choose whether to allow sensitive content to be shown in lock screen notifications. Heads-up notifications make it possible for the system UI to put important information in front of the user without disrupting the state of the currently running activity. Priority – The priority level determines how and when notifications are presented. For example, In Android 5.0, high-priority notifications are displayed as Heads-up notifications. Visibility – Specifies how much notification content is to be displayed when the notification appears on the lock screen. Category – Informs the system how to handle the notification in various circumstances, such as when the device is in Do Not Disturb mode. Note: Visibility and Category were introduced in Android 5.0 and are not available in earlier versions of Android. Beginning with Android 8.0, notification channels are used to control how notifications are presented to the user. Big Text – In contracted mode, displays an excerpt of the first line of the message followed by two periods. In expanded mode, displays the entire message (as seen in the above example). Inbox – In contracted mode, displays the number of new messages. In expanded mode, displays the first email message or a list of the messages in the inbox. Image – In contracted mode, displays only the message text. In expanded mode, displays the text and an image. Beyond the Basic Notification (later in this article) explains how to create Big Text, Inbox, and Image notifications. Beginning with Android 8.0 (Oreo), you can use the notification channels feature to create a user-customizable channel for each type of notification that you want to display. Notification channels make it possible for you to group notifications so that all notifications posted to a channel exhibit the same behavior. For example, you might have a notification channel that is intended for notifications that require immediate attention, and a separate "quieter" channel that is used for informational messages. Set the Importance level to Urgent, High, Medium, or Low, which configures the level of sound and visual interruption. Turn the notification dot on or off. Turn the blinking light on or off. Show or hide notifications on the lock screen. Override the Do Not Disturb setting. Notice that you do not have absolute control over how your notification channels interact with the user – the user can modify the settings for any notification channel on the device as seen in the screenshots above. However, you can configure default values (as will be described below). As these examples illustrate, the new notification channels feature makes it possible for you to give users fine-grained control over different kinds of notifications. To create a notification in Android, you use the NotificationCompat.Builder class from the Xamarin.Android.Support.v4 NuGet package. This class makes it possible to create and publish notifications on older versions of Android. For more information about using NotificationCompat.Builder, see Compatibility later in this topic. The content, including the title, the message text, and the notification icon. The style of the notification, such as Big Text, Inbox, or Image style. The priority of the notification: minimum, low, default, high, or maximum. On Android 8.0 and higher, the priority is set via a notification channel. The visibility of the notification on the lock screen: public, private, or secret. Category metadata that helps Android classify and filter the notification. An optional intent that indicates an activity to launch when the notification is tapped. The ID of the notification channel that the notification will be published on (Android 8.0 and higher). After you set these options in the builder, you generate a notification object that contains the settings. To publish the notification, you pass this notification object to the Notification Manager. Android provides the NotificationManager class, which is responsible for publishing notifications and displaying them to the user. A reference to this class can be obtained from any context, such as an activity or a service. An ID string that is unique to the package that will identify the channel. The name of the channel that will be displayed to the user. The name must be between one and 40 characters. The importance of the channel. The notification channel should be created each time the activity is created. For the CreateNotificationChannel method, it should be called in the OnCreate method of an activity. Call various methods on the NotificationCompat.Builder object to set notification options. Call the Build method of the NotificationCompat.Builder object to instantiate a notification object. Call the Notify method of the notification manager to publish the notification. In this example, a new NotificationCompat.Builder object called builder is instantiated, along with the ID of the notification channel to be used. The title and text of the notification are set, and the notification icon is loaded from Resources/drawable/ic_notification.png. The call to the notification builder's Build method creates a notification object with these settings. The next step is to call the Notify method of the notification manager. To locate the notification manager, you call GetSystemService, as shown above. The Notify method accepts two parameters: the notification identifier and the notification object. The notification identifier is a unique integer that identifies the notification to your application. In this example, the notification identifier is set to zero (0); however, in a production application, you will want to give each notification a unique identifier. Reusing the previous identifier value in a call to Notify causes the last notification to be overwritten. The notification icon is displayed on the left hand side of the notification – this image of a circled “i” has an alpha channel so that Android can draw a gray circular background behind it. You can also supply an icon without an alpha channel. To display a photographic image as an icon, see Large Icon Format later in this topic. This example causes the device to vibrate when the notification is published. The body of the previous notification is reused – only the title and the text of the notification changes while the notification is displayed in the notification drawer. The title text changes from "Sample Notification" to "Updated Notification" and the message text changes from "Hello World! This is my first notification!" to "Changed to this message." The user dismisses the notification (or taps Clear All). The application makes a call to NotificationManager.Cancel, passing in the unique notification ID that was assigned when the notification was published. For more about updating Android notifications, see Modify a Notification. In Android, it's common for a notification to be associated with an action – an activity that's launched when the user taps the notification. This activity can reside in another application or even in another task. To add an action to a notification, you create a PendingIntent object and associate the PendingIntent with the notification. A PendingIntent is a special type of intent that allows the recipient application to run a predefined piece of code with the permissions of the sending application. When the user taps the notification, Android starts up the activity specified by the PendingIntent. Tapping this notification takes the user back to the originating activity. In a production app, your app must handle the back stack when the user presses the Back button within the notification activity (if you are not familiar with Android tasks and the back stack, see Tasks and Back Stack). In most cases, navigating backward out of the notification activity should return the user out of the app and back to Home screen. To manage the back stack, your app uses the TaskStackBuilder class to create a PendingIntent with a back stack. Another real-world consideration is that the originating activity may need to send data to the notification activity. For example, the notification may indicate that a text message has arrived, and the notification activity (a message viewing screen), requires the ID of the message to display the message to the user. The activity that creates the PendingIntent can use the Intent.PutExtra method to add data (for example, a string) to the intent so that this data is passed to the notification activity. This retrieved message, "Greetings from MainActivity!," is displayed in the SecondActivity screen, as shown in the above screenshot. When the user presses the Back button while in SecondActivity, navigation leads out of the app and back to the screen preceding the launch of the app. For more information about creating pending intents, see PendingIntent. Notifications default to a simple base layout format in Android, but you can enhance this basic format by making additional NotificationCompat.Builder method calls. In this section, you'll learn how to add a large photo icon to your notification, and you'll see examples of how to create expanded layout notifications. Android notifications typically display the icon of the originating app (on the left side of the notification). However, notifications can display an image or a photo (a large icon) instead of the standard small icon. For example, a messaging app could display a photo of the sender rather than the app icon. Notice that when a notification is presented in large icon format, the small app icon is displayed as a badge on the lower right corner of the large icon. This example code opens the image file at Resources/drawable/monkey_icon.png, converts it to a bitmap, and passes the resulting bitmap to NotificationCompat.Builder. Typically, the source image resolution is larger than the small icon – but not much larger. An image that is too large might cause unnecessary resizing operations that could delay the posting of the notification. This expanded layout format also includes summary text at the bottom of the notification. The maximum height of the Big Text notification is 256 dp. In this example, the message text and summary text are stored in the BigTextStyle object (textStyle) before it is passed to NotificationCompat.Builder. 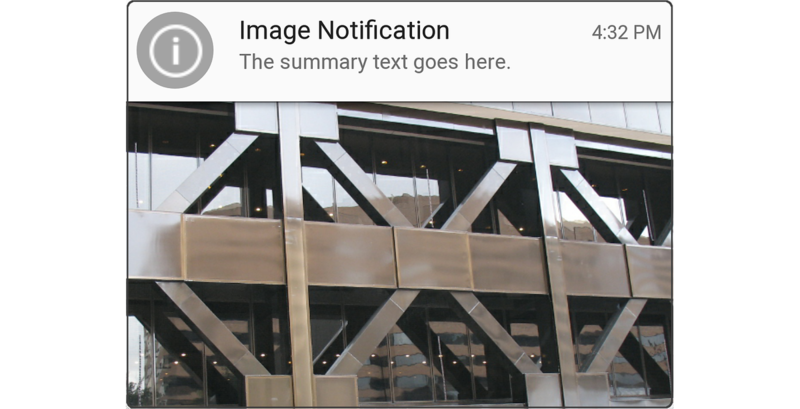 The Image style (also called the Big Picture style) is an expanded notification format that you can use to display an image in the body of a notification. For example, a screenshot app or a photo app can use the Image notification style to provide the user with a notification of the last image that was captured. Note that the maximum height of the Image notification is 256 dp – Android will resize the image to fit into this maximum height restriction, within the limits of available memory. Notice that when the notification is displayed in compact format, it displays notification text (the text that is passed to the notification builder's SetContentText method, as shown earlier). However, when the notification is expanded to reveal the image, it displays summary text above the image. Like the SetLargeIcon method of NotificationCompat.Builder, the BigPicture method of BigPictureStyle requires a bitmap of the image that you want to display in the body of the notification. In this example, the DecodeResource method of BitmapFactory reads the image file located at Resources/drawable/x_bldg.png and converts it into a bitmap. If you don't know the size of the image file in advance, it's a good idea to wrap the call to BitmapFactory.DecodeFile in an exception handler – an OutOfMemoryError exception might be thrown if the image is too large for Android to resize. For more about loading and decoding large bitmap images, see Load Large Bitmaps Efficiently. To add new lines of text to the notification body, call the Addline method of the InboxStyle object (the maximum height of the Inbox notification is 256 dp). Note that, unlike Big Text style, the Inbox style supports individual lines of text in the notification body. You can also use the Inbox style for any notification that needs to display individual lines of text in an expanded format. For example, the Inbox notification style can be used to combine multiple pending notifications into a summary notification – you can update a single Inbox style notification with new lines of notification content (see Updating a Notification above), rather than generate a continuous stream of new, mostly similar notifications. 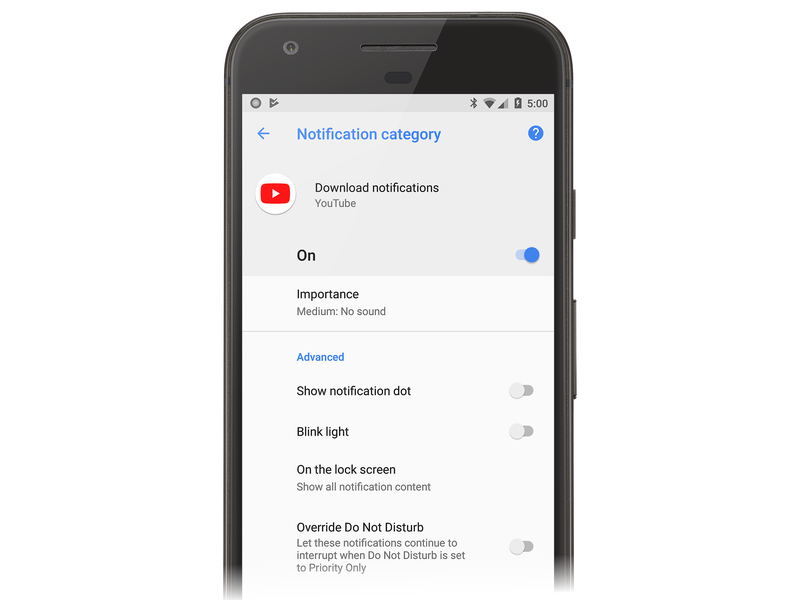 NotificationCompat.Builder includes methods that you can call to set metadata about your notification, such as priority, visibility, and category. 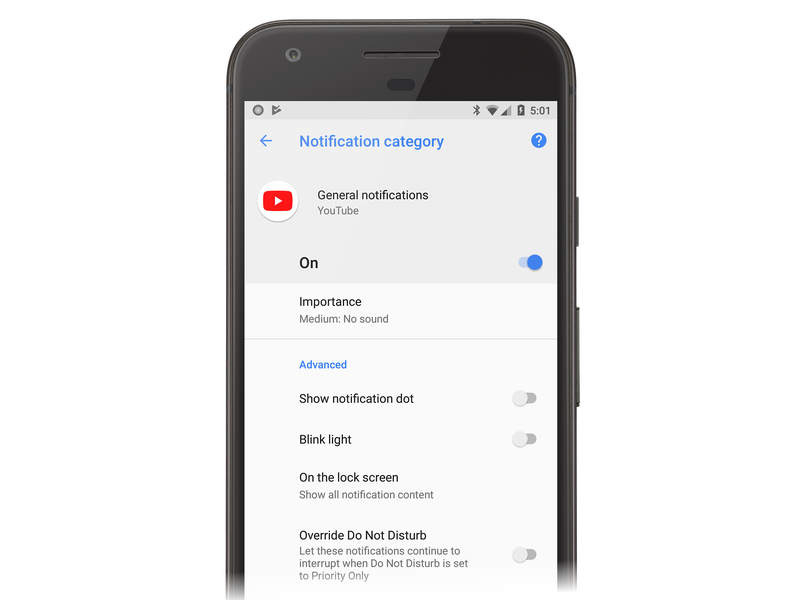 Android uses this information — along with user preference settings — to determine how and when to display notifications. Where the notification appears in relation to other notifications. For example, high priority notifications are presented above lower priority notifications in the notifications drawer, regardless of when each notification was published. Whether the notification is displayed in the Heads-up notification format (Android 5.0 and later). Only high and maximum priority notifications are displayed as Heads-up notifications. NotificationPriority.Max – Alerts the user to an urgent or critical condition (for example, an incoming call, turn-by-turn directions, or an emergency alert). 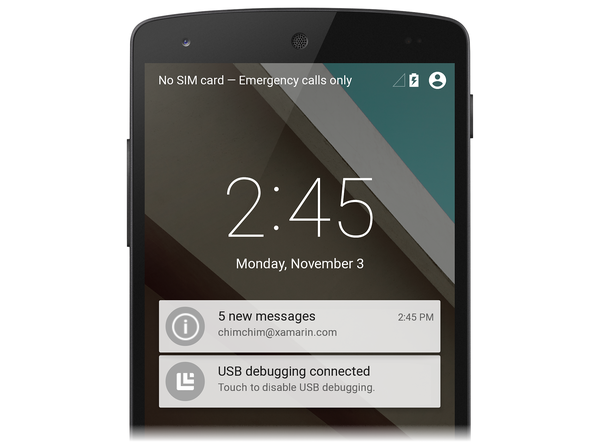 On Android 5.0 and later devices, maximum priority notifications are displayed in Heads-up format. NotificationPriority.High – Informs the user of important events (such as important emails or the arrival of real-time chat messages). On Android 5.0 and later devices, high priority notifications are displayed in Heads-up format. NotificationPriority.Default – Notifies the user of conditions that have a medium level of importance. NotificationPriority.Low – For non-urgent information that the user needs to be informed of (for example, software update reminders or social network updates). NotificationPriority.Min – For background information that the user notices only when viewing notifications (for example, location or weather information). Because the "Thought for the day" notification is a low-priority notification, Android will not display it in Heads-up format. On Android 8.0 and higher, the priority of the notification channel and user settings will determine the priority of the notification. NotificationVisibility.Public – The full content of the notification is displayed on the secure lock screen. NotificationVisibility.Private – Only essential information is displayed on the secure lock screen (such as the notification icon and the name of the app that posted it), but the rest of the notification's details are hidden. All notifications default to NotificationVisibility.Private. NotificationVisibility.Secret – Nothing is displayed on the secure lock screen, not even the notification icon. The notification content is available only after the user unlocks the device. In this example, NotificationsLab is the name of the originating app. This redacted version of the notification appears only when the Lock screen is secure (i.e., secured via PIN, pattern, or password) – if the lock screen is not secure, the full content of the notification is available on the lock screen. Notification.CategoryCall – Incoming phone call. Notification.CategoryMessage – Incoming text message. Notification.CategoryAlarm – An alarm condition or timer expiration. Notification.CategoryEmail – Incoming email message. Notification.CategoryEvent – A calendar event. Notification.CategoryPromo – A promotional message or advertisement. Notification.CategoryProgress – The progress of a background operation. Notification.CategorySocial – Social networking update. Notification.CategoryError – Failure of a background operation or authentication process. Notification.CategoryTransport – Media playback update. Notification.CategorySystem – Reserved for system use (system or device status). Notification.CategoryService – Indicates that a background service is running. Notification.CategoryRecommendation – A recommendation message related to the currently running app. Notification.CategoryStatus – Information about the device. When the user configures Do not disturb to block all interrupts except for phone calls (as illustrated in the above screenshot), Android allows notifications with a category setting of Notification.CategoryCall to be presented while the device is in Do not disturb mode. Note that Notification.CategoryAlarm notifications are never blocked in Do not disturb mode. The LocalNotifications sample demonstrates how to use NotificationCompat.Builder to launch a second activity from a notification. 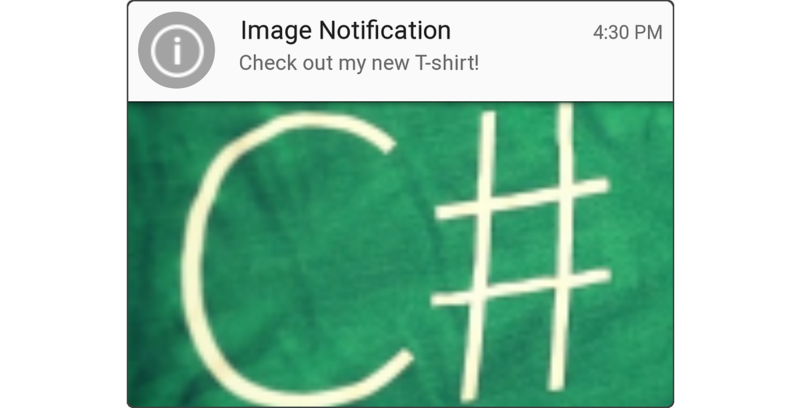 This sample code is explained in the Using Local Notifications in Xamarin.Android walkthrough. Similarly, your app can use NotificationCompat.InboxStyle and NotificationCompat.BigPictureStyle for Inbox and Image styles, respectively. NotificationCompat.Builder supports the SetPriority method (available starting with Android 4.1). However, the SetCategory method is not supported by NotificationCompat.Builder because categories are part of the new notification metadata system that was introduced in Android 5.0. In this example, the app's Target Framework is set to Android 5.0 and the Minimum Android Version is set to Android 4.1 (API Level 16). Because SetCategory is available in API level 21 and later, this example code will call SetCategory only when it is available – it will not call SetCategory when the API level is less than 21. This article explained how to create local notifications in Android. It described the anatomy of a notification, it explained how to use NotificationCompat.Builder to create notifications, how to style notifications in large icon, Big Text, Image and Inbox formats, how to set notification metadata settings such as priority, visibility, and category, and how to launch an activity from a notification. 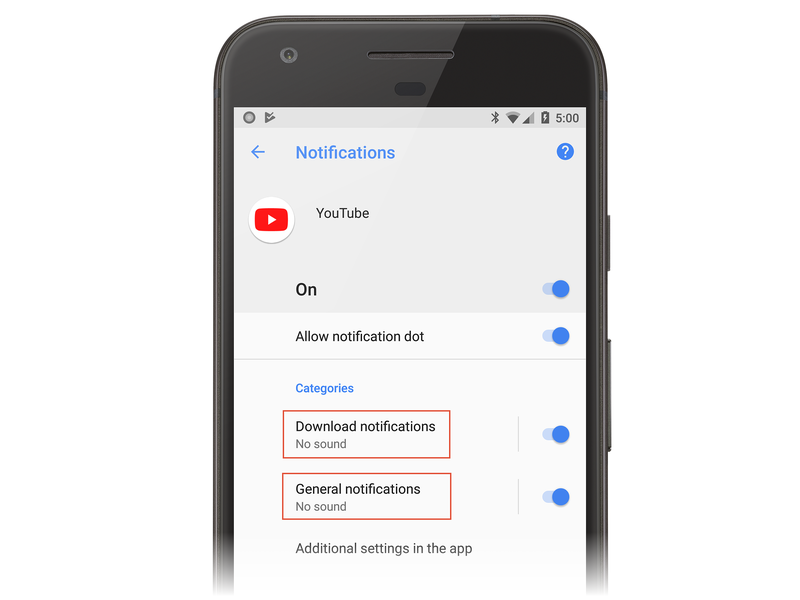 This article also described how these notification settings work with the new Heads-up, lock screen, and Do not disturb features introduced in Android 5.0. Finally, you learned how to use NotificationCompat.Builder to maintain notification compatibility with earlier versions of Android. 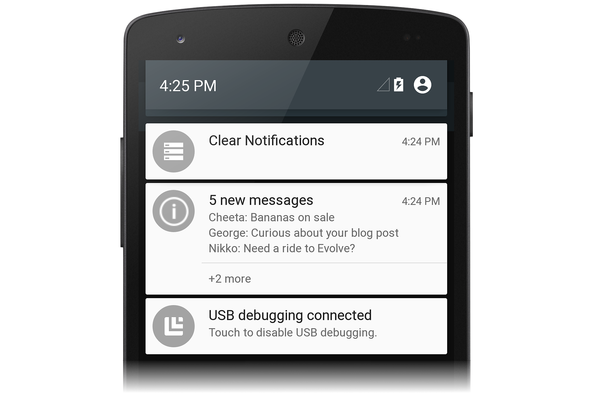 For guidelines about designing notifications for Android, see Notifications.